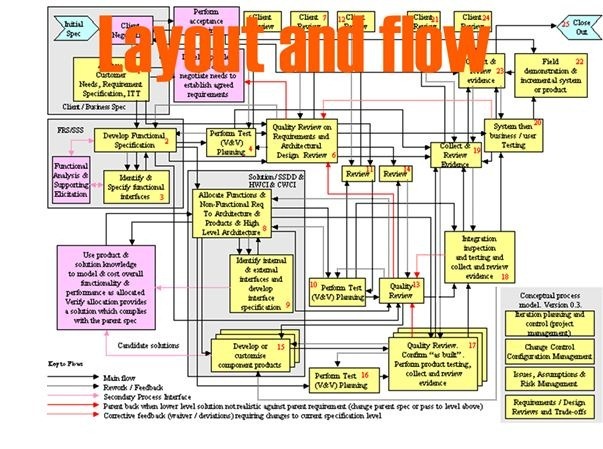 Here is an example of a flowchart with some real layout and flow problems. While it may be obvious to the consultants or authors of this map what’s going on, it’s very hard for anyone else to follow. It all went horribly wrong in the making. The reader has to follow too many directions, too many overlapping links, and the flowchart suddenly becomes unreadable. It’s a great example of why simply layout and flow will win the day every time. After all good communication is the critical factor in any project. Remember that fact before you release your next flowchart for the project.